* literally, through the traditional work of ranching, raising and herding of cattle and sheep. * spiritually and aesthetically, through its beauty, its change of seasons, the variation of light and shadow and weather, its geological formations, its botany and biology, and its amazing array of wildlife. The artists featured include Guadalupe Morales whose work in oils evokes a sense of nostalgia in his traditional approach to the dramatic contrasts of light and shadow. If you imagine a pleasant dusky evening around the veranda of a typical adobe dwelling and a soft light shining through a window as a rancher or cowboy works outside doing evening chores, perhaps amid reflected moon light, you will find yourself engrossed in Guadalupe’s work. Kim Gibson takes us on a sort of photo realist journey through her highly illustrated giclee print works (made from her original paintings). One of her works features cowboys around a campfire in a snowy-forested area. Are they herding cattle, hunting, or looking for strays? A wildlife theme also seems ever-present in her work. Accomplished sculptor Jane Lumsden’s work features animals (horses, birds, and fish) beautifully rendered in bronze with a suggestion of context through the display she creates for her pieces. Melody Perez paints landscapes, often involving horses, in portraits, pairs and herds, alive and colorful, light and bright. Melody and her husband manage a mustang ranch just north of Las Vegas. They are both musicians and perhaps they will entertain us at the August 8 reception. 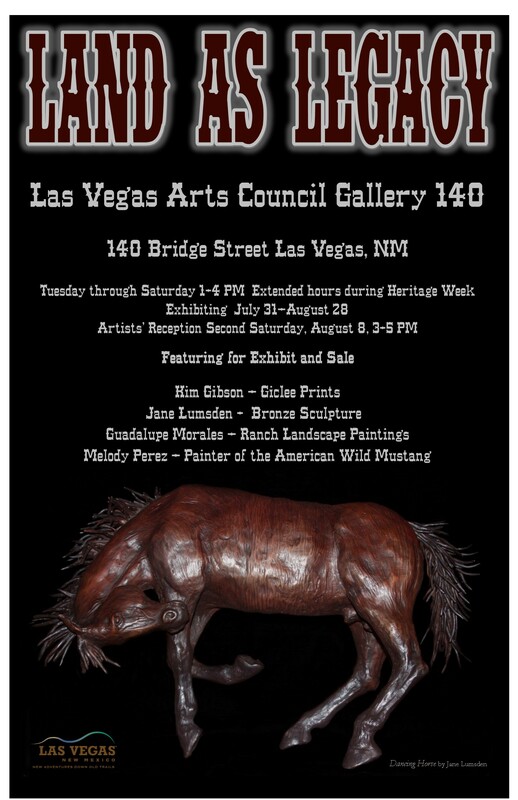 This exhibit was curated and reviewed by Linda Wooten-Green for LVAC.